This article was previously published in American Bee Journal November 2004 page 856, you might obtain a copy of this issue or a subscription from Dadant or go to http://www.dadant.com/journal/ . I would like to personally thank Dadant for publishing this article in their fine beekeeping Magazine. I am just a common beekeeper, not a researcher or a scientist. I began Beekeeping in the year 1992 with a desire to have bees to produce honey for my families use and a long desire to keep bees from since my childhood. 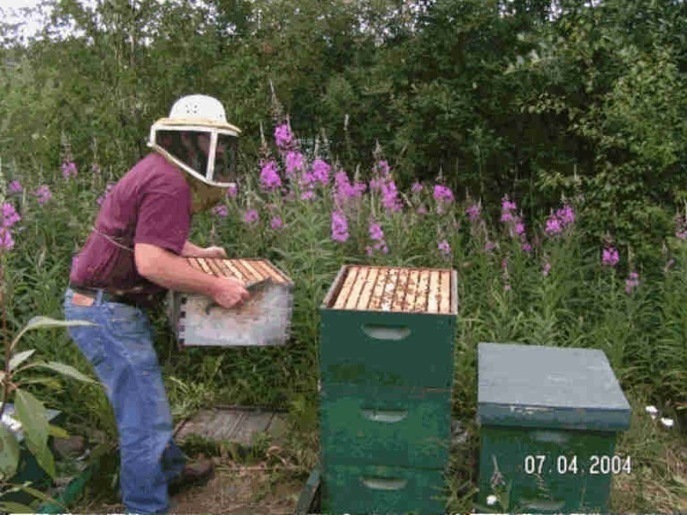 For the longest time I never realized that honey bees could be kept in Alaska, one day I read an article in our local news paper about a gentleman in my community that kept bees. This got me thinking that the possibility of keeping bees in Alaska was something I might try. In time I took my first steps towards my adventures of keeping bees. It began by being mentored by the same person that the news paper article was written about a couple of years prior to me beginning Beekeeping. I called him up, he invited me to the local beekeeping association meeting, I ordered two package bees, equipment for two hives and I still knew very little about keeping bees. Knowing very little about keeping bees I went to the local library and found a few books on beekeeping, one being ABC & XYZ of Beekeeping. I read the book from cover to cover and soon I was wondering what I had gotten myself into. The parts about “Anger of Bees” and “Swarms” frightened me to death, but I was pretty committed since I already invested money and time into this adventure. My mentor assured me I had nothing to fear. He also told me that hiving the bees was a piece of cake and I would not even need a vail to do it, I believed him. My first day with the bees was one of the scariest day of my life, but I hived the bees sweating all the way without a vail and getting zero stings. Since that day, stings are something I look forward to each spring after a long cold beeless winter and my learning of the honey bee has never stopped. I am constantly learning and searching for answers and clues to better my beekeeping methods. After the first year keeping only two colonies I bought into my mentors honey business and helped keep over 300 colonies. There was a lot I learned from this beekeeper who was pretty good at obtaining quality honey and pollen from the apiaries. Unlike a lot of beekeepers in Alaska he was a beekeeper who practiced keeping bees year round instead of starting new each year with package bees. We did have to bring in new package bees each spring to maintain our numbers for production from winter losses. This was very costly because there was money invested in wintering the colonies and those that died over winter had money in them from sugar and insulation and they also needed replaced if dead. Winter losses were very high and most of those that did survive were either week, needing combined or they did not really amount to much through the season. I wanted to improve our over-wintering successes by breeding from survivors but was instructed by my mentor that breeding bees could not be done in Alaska, at this time I took his word for this. I was still learning as I am today. I was with this company for a few years before I decided to go it on my own. After leaving this company I was freer to explore my own ideas of keeping bees and what I thought needed to be done to successfully keep bees in Alaska. There is no book on how to keep bees up here, but there are many books that tell how to keep bees much further south. I took from these books what I could apply to here and did experiments to see what the limits of bees are up here. My experiments were not done scientifically; instead I made only personal observations really not needing to prove anything to anyone but myself. After trying for years to succeed in wintering as I was taught, and nearly giving up on the idea that it could be done routinely, instead of giving up I decided it was time for me to get serious about keeping bees. I thought that since the methods I was taught were failing the bees then maybe a lot of what I was taught was wrong and began to rethink my methods. Maybe the strain I was using was wrong, the feed I was using was wrong, the insulation I used was wrong, But who knew, I knew I didn’t know. This is about the time I finally got a computer and then I started searching on the Internet for more answers and help. It was not long after I found new mentors and helpers far from my home and Ironically in a place where instead of the freezing cold of snow and ice my new mentors kept bees in a hot dry dessert, who knew we would have so many similarities in keeping bees. They are Ed & Dee Lusby of Arizona, beekeepers in a traditional sense and like me has strong desires to keep bees clean with out the use of foreign substances. With Ed & Dee I have learned that the cold does not kill the cluster, honey is one of the most nutritious of bee feeds, insulation may not be needed up here, comb orientation could be helpful, and breeding bees is essential to keeping bees locally. Along with these new insights I have learned of what is called Small Cell Beekeeping (SCB) where Foundation with a cell pattern sizing of 4.9 mm top tolerance is a cell size that is more in the bees natural cell size being in the middle of the natural range of cell size. A natural range would be from 4.6 mm to 5.1 mm and 4.9 mm being near mid-range. Long ago I used 5.4 mm cell size, then about Eight years ago I used Pierco which was 5.25 mm cell size and now I use 4.9 mm cell size. Cell size has many ramifications and presents dynamics I never considered before. Apparently bees long ago were kept on combs that were much smaller than what is commonly used today by most beekeepers. When I first heard of using smaller cells I had to find some things out for myself about older cell sizes and modern cell sizes so I bought books that were over one hundred years old to find out about older cell sizing before I was convinced that there may just be something in this SCB. At present I am still learning and observing the methods of SCB and am not recommending beekeepers change over to smaller cells but I am saying it could not hurt to try it on a small scale. I at present have all the colonies I keep on small cells. Newly drawn 4.9 mm brood comb frame. Here in Alaska we are subject to using what few strains of honeybees that is available and those that are bred much further south in places like California, Texas, Alabama, and Georgia. Some beekeepers also obtain queens that are bred in Southern Canada and some of the northern USA states. My point is that all bees normally have come from outside Alaska and were not bred for or acclimatized for Alaska weather and forage availability up here. I have used many, many different strains of honey bees and at present I have settled on using strictly the USDA Russian strain obtained in eastern Asia in the location of the Primorsky region. In my own personal observation it has performed well if not the best in my apiaries. They build up fast in the spring, bring in a heavy honey crop, have longevity, winter very good, stay quite in the winter not becoming active to soon, make cleansing flights when weather warms in mid to late March instead of in February like other strains, and This strain came through our last winter stronger than any strain I have used in the past twelve years without insulation. I have decided to use this strain to take my beekeeping to the next level where I will begin to breed bees more suited to the local conditions where I keep bees. 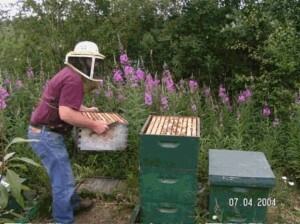 There are not a lot of serious beekeepers in Alaska so I am virtually on my own but not totally. There are a small handful of other serious beekeepers up here that are just beginning to talk of cooperating in breeding honey bees specific for Alaska. A hive that has been Demaree’d, this is one of the queen mothers of the A1 queens of the Russian stock I keep, top box is heavy with Honey. Fireweed blooms in the background. I started SCB the spring of 2002. I felt I needed a short cut for building combs, because of our short season in Alaska. Instead of doing the normal shake down of a colony to force the bees to build the smaller cells, which usually takes a couple years of several shake downs, I bought package bees that were already regressed. 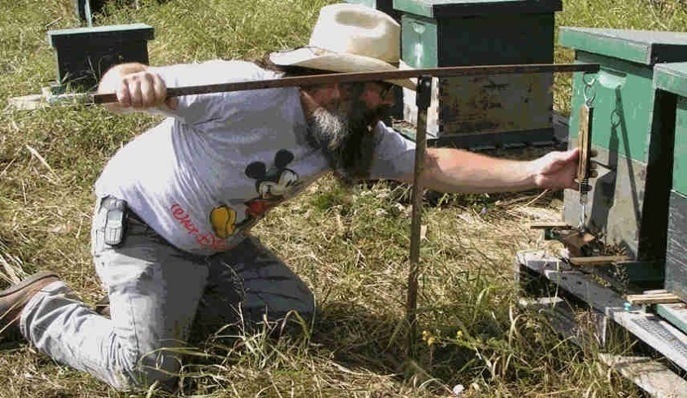 There is a supplier of package bees in Alabama that has his bees on small cells so I purchased 14 package bees with Caucasian queens from him that year. From the bees memory they will try to build the size comb they were on most recently. It worked great and I was able to have bees on Small cells in one season. I also got five package bees with Russian queens from my normal supplier in northern California the same year. My first year with Russians, this line of Russians are still surviving and are being used as my queen mothers this year. They were large cell bees and I needed a plan to get them on small cells. I used the drawn out Pierco frames (5.25 mm sizing) to start them and as the core of the nest was capped brood I would once a week insert a small cell foundation frame into the center of the nest in between capped brood. As the nest expanded I was able to put two small cell frames into the nest at a time. This worked well for most Russian colonies but sometimes the combs were transition cells not 4.9 mm but a few colonies drew nearly perfect small cell combs. I felt that the Russians were possibly good candidates for SCB. That year I only fed 3/4 of a gallon of syrup to each colony start them on foundation and I took no honey to give the colonies every chance to survive the winter. The following spring of 2003 I lost 16.6 percent of the colonies. Caucasians were in oneyard and the Russians were in another yard a little over three miles away. I had 15 colonies total out of the 19 started the year before. I decided I would not bring in package bees for myself and instead try to do splits and some nucs to try increasing the stock. I think I may have spread the bees to thin that season because this spring of 2004 I only got 4 colonies through the winter. One good thing though is that two colonies of the Russian line made it through winter stronger than any colony I ever got through winter in my twelve years of keeping bees and that was with no wrap insulation on the hive bodies. I do put a 1/2 inch board of Urethane with the foil on one side with foil down on top of the inner cover. I did have a lot of colonies flying in February with cleansing flights in the Caucasian yard while the Russian yard seemed dead with no activity during this early warm period. As time went on the Caucasian yard began losing colonies as more and more bees came out on those few days that were warm enough for cleansing flights. In the Russian yard the bees remained quite and clustered, somehow they knew it was to early to break cluster. 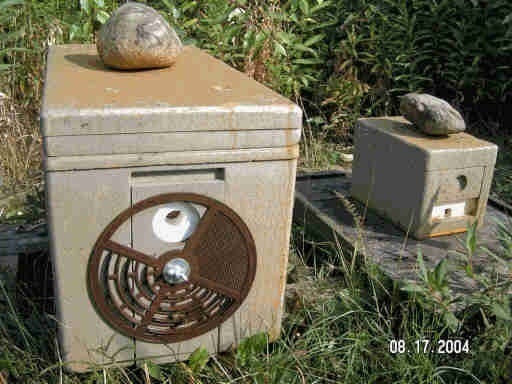 The Caucasian colonies made a mess in front of their hives while the Russians had relatively clean hives. Percentage wise the Russians made it through winter only losing about 50 percent of the colonies while the Caucasian yard lost over 90 percent. From this display I decided to go strictly with Russians in both yards and begin breeding from this line. I have not monitored varroa mite levels for the past two years and only began doing so on one hive this year. I am only monitoring levels for curiosity sake. I feel that a test for varroa levels might not tell me the truth of what is really going on in the colony. Does a high might drop on a varroa board tell me there are a high level in the colony or does it tell me the bees are doing a good job grooming or getting rid of the mites. Does a low level tell me there are not very many mites in the colony or does it tell me the bees are not doing a very good job grooming or getting rid of the mites in the colony. Survival is what I judge my bottom line to, if they die these are not the genetics I am looking for in breeding and keeping bees. I have begun to incorporate a few new methods in my beekeeping practices. One is I am now starting this fall going to weigh hives twice in the fall, once around August 1st and once around September 1st, then in the spring around April 1st. I am hoping to discover a trend that will tell me how much a hive needs to weigh before entering winter. Another new thing I am doing is sending genetic material of my best over wintered stock to my package bee and queen supplier in California to have the genetic material grafted and bred with his Russian stock. These queens, I have named A1, will be installed into package bees and sold to whoever wishes to improve their own stock for wintering. Normally Package bees have outside queen sources and when drones are produced they are of stock that are not winter proven, these queens I will now be supplying will have queens of wintered stock and the drones will also be of winter proven stock. I am hoping that this will enhance the breeding program I am doing to help improve winter-ability of colonies in Alaska. Hive scale I created to aid me in weighing hives, there is a fish scale on the business end of the lever, I multiply the weight read weighing one end of the hive by 3.25 to get correct or actual weight of hive. It may not be totally accurate but it serves my needs and is easy to use. Another new Item I am trying out this year is Styrofoam Nucs supplied by BetterBee beekeeping Supply. I have been successful in wintering single deeps, double deeps and triple deeps but I have failed at getting five frame nucs through the winter, I am hoping these Styrofoam nucs will help me to succeed in this area over-wintering five frame nucs. This would help me to make the increase I need to make up for winter losses, help supply me with locally produced queens in the spring when needed and enable me to start two queen hives with local queens in early spring. One of my goals is to become more self sufficient. Another Styrofoam unit I started using this summer is a mini-mating nuc supplied by Mann Lake beekeeping supply. These have proved to be very useful and work really well with a high success rate of producing mated queens for me. I tried five out this summer and I will get 20 or thirty more next season. These are the two new items I am using to aid with queen mating and making increase, the five frame Polystyrene nuc from BetterBee and the Mini-Mating nuc from Mann Lake. They worked really well for mating queens. My future plans and Goals for improving beekeeping in Alaska are to gather like minded beekeepers in the state and form an association dedicated to caring for and improving conditions for honey bees in Alaska. I have founded a Guild called “Apiarian Breeders Guild” for this purpose. Although it will be started in Alaska beekeepers that are like minded from anywhere can take part and create chapters if they wish. I have created an email group where beekeepers can discuss topics concerning “Apiarian Breeders Guild” at,http://groups.yahoo.com/group/ApiarianBreedersGuild/ , All like minded beekeepers are welcome to join. 1. insure the survivability of honey bees in Alaska. over-wintering, queen-rearing, hive management, increasing apiary stock, bee health and pest control, including creating a research apiaries owned by the Guild. community of beekeepers in this state. 6. Share resources that provide a means of breeding bees if needed by members. 7. Develop ways and means of increasing stock in our short season. 8. 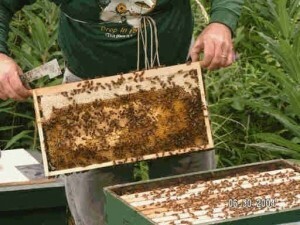 Teach Alaska beekeepers and potential beekeepers how to be stewards of honeybees. 9. To create and maintain a Web Site for sharing our knowledge and skills with others. 10. Fellowship with fellow beekeepers. This is a Guild of Beekeepers standing together for the health, welfare, and survivability of Honey bees that we love and admire. Please call concerning swarms, use my contact number here, and if you can please send me a picture of this bee so a positive ID can be made so it is handled correctly.